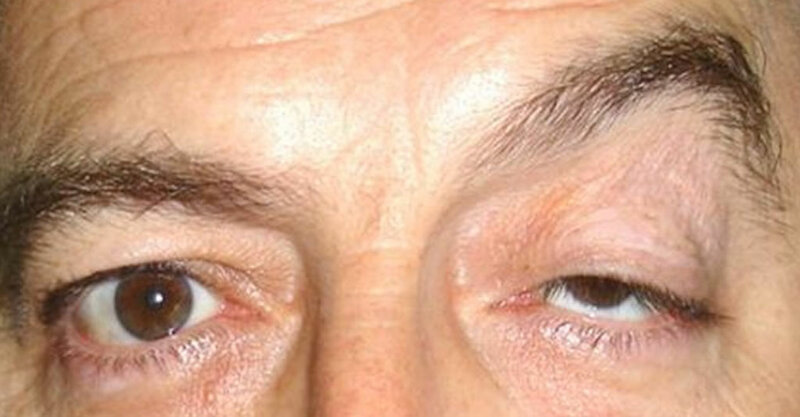 Ptosis is a drooping eyelid that can cover the pupil and make it difficult to see. A number of causes can lead to this condition. Treatment is available. Ptosis is a dropping upper eyelid that can range from being barely noticeable to covering the pupil of the eye to affecting the vision. This condition typically occurs because of aging but it can affect children as well as adults. In most cases, it will affect both eyes. In some cases, the condition is present at birth but in most cases it is caused by aging. It may be caused by damage to the levators or the muscles responsible for lifting the eyelid. Some patients develop the condition as a side effect to corrective eye surgery or cataract surgery. Eye tumors, systemic diseases or neurological disorders can also cause the eyelid to droop. The condition is typically identified due to the drooping eyelid which may cause difficulty seeing. You may feel like you need to raise your eyebrows or tilt your head in order to lift the eyelid so you can see properly. The amount the eyelid droops will vary from patient to patient. You can often use old pictures of yourself to determine how the position of the eyelid has changed as a means of identifying the problem. Your doctor will be able to determine if your drooping eyelids is caused by the condition or the similar condition, dermatochalasis. This condition causes the connective tissues to break down, causing the skin to hang loosely. In most cases, the condition is treated by performing a surgery known as a blepharoplasty that will tighten the levator muscles, so it is easier for you to see. This will also improve the appearance of the eye. The eyelid can also be pinned back under the eyebrow to act as a substitute for levator muscles that are too weak to perform their job properly. Once the surgery has been completed, your eyelids will appear higher but they may not be symmetrical. In rare cases, you may lose movement in the eyelid. Choosing a reputable surgeon is essential to avoiding these side effects. Select a surgeon that regularly performs blepharoplasty surgery and speak to other patients that have worked with this surgeon to better understand what your experience will be like. Children that are born with moderate to severe condition will need surgical treatment or their vision will not develop properly. Untreated cases can lead to the development of amblyopia or poor vision in one eye. This can also lead to a lifetime of vision problems for the affected patient. Children that have mild cases should visit your eye care practitioner annually. Your child's eyes will change shape as they develop and their bodies become larger. In some cases, this can lead to the symptoms becoming worse, requiring the child to seek treatment that was not previously necessary.